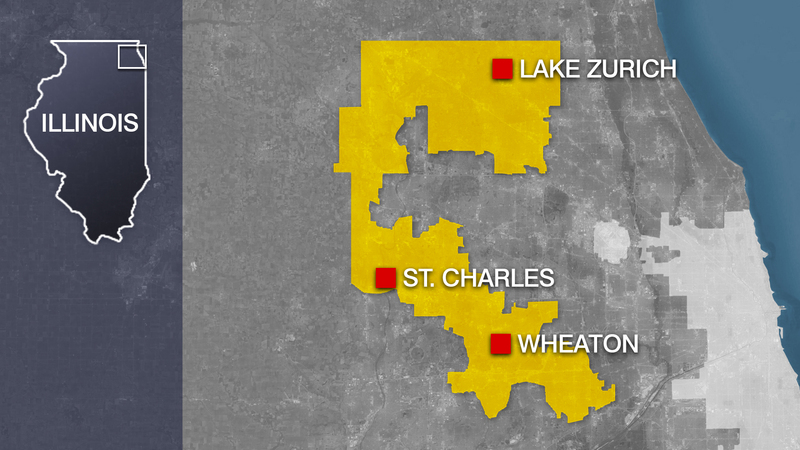 As Democrats aim to retake control of the U.S. House, they’re pinning hope on voters who live in Illinois’ 6th Congressional District. But first, primary voters need to decide who will be the nominee. It’s a crowded field of seven, who are unified in their belief that Republican U.S. Rep. Peter Roskam of Wheaton has to go. (Get fun facts about each candidate here.) The 6th District, which spans from Lake and McHenry counties to DuPage and Kane and parts of Cook, has been represented since 2006 by Roskam, who has no primary contest. The area is known as a Republican stronghold; Roskam has won it fairly handily six times, going back to the year he beat now-U.S. Sen. Tammy Duckworth in 2006. But Hillary Clinton’s defeat of President Donald Trump in the district by seven points has Democrats hyper-motivated after Trump’s election and pointing to a change in demographics, optimistic they can “Flip the Sixth” (there’s an organized local movement geared up for already for the general). Amanda Howland came up short in her attempt to defeat Roskam two years ago with, she says, little official party backing, but can now count on built-up name recognition. She’s counting on the district’s savvy constituents to be frustrated with Roskam as an architect of the new federal tax code, which will limit state and local tax deductions, like for property taxes and business expenses. “I hear about it all the time because those that are getting that small increase right now in their paycheck, when they go to do their taxes next year and they find out they can no longer itemize student loans, or state and local taxes, or some of their business expenses, it’s going to hit them hard, because the majority of this district itemizes,” Howland said. The Lake Zurich attorney is a former educator of emotionally disturbed students and a College of Lake County trustee who favors a single-payer health care system. The cost of college is a focal point for Jennifer Zordani, a financial services regulatory attorney, who grew up in the western suburbs and lives in Clarendon Hills. Three other women were motivated to run in part by a desire to fix the health care system following personal health crises. Carole Cheney, an attorney who lives in Naperville, served as chief of staff to U.S. Rep. Bill Foster. Cheney says she got into public service after losing her life savings after major surgery. She now relies on the Affordable Care Act, and says she is prepared to help local constituents navigate it while also pushing politics in Washington. Becky Anderson Wilkins is a breast cancer survivor who won a competitive race for her seat on the Naperville City Council; you may run into her if you frequent her family’s Anderson’s Bookshop, with locations in Aurora, Downers Grove, LaGrange and Naperville (both are experiences she says show she knows how to manage budgets and connect with people). “We can’t keep trying to repeal the ACA. Let’s fix it. Let’s make sure that we have an option for people to buy into Medicare, so they can make sure that their families are covered, that women and their families are covered, and that … money is going to them, to individual people, and not going to the CEOs and the stockholders of these companies,” Anderson Wilkins said. Kelly Mazeski, a chemist-turned-financial adviser by trade who cites 18 years of community service, also survived breast cancer. “When I was going through chemo our insurance company of 20 years informed me they weren’t going to cover us the following year. So I want to provide quality, affordable healthcare for everyone. And I’m committed to that,” Mazeksi said. She’s now is on the Barrington Hills Planning Commission and the Illinois Environmental Council, and says protecting the planet is an urgent priority. The environment is also top of mind for Sean Casten, a clean energy entrepreneur. Casten says Washington should make a lot of changes to reduce carbon emissions. Ryan Huffman of Palatine, a 31-year-old data analyst with a degree in public policy from the University of Chicago who served at the White House under President Barack Obama, believes that money is the biggest problem in politics. “I’m so stubbornly committed to getting the money out of politics that I’m not willing to play the same games we’ve always played. And that’s something that people on both sides of the aisle are frustrated with. It’s difficult for Democrats to make the case that ‘well, we’re better than Republicans’ when we just say ‘well they take corporate money, we just take a little bit less,’” Huffman said. He wants to move to a public financing system. The Tribune’s editorial board endorsed Cheney, as did the Daily Herald’s, while the Chicago Sun-Times went with Mazeski, who is also backed by Emily’s List. Fundraising is another way to gauge support. New totals won’t be published until March, but the latest figures from Illinois Election Data have Mazeski and Casten in front with roughly $513,086 and $408,431, respectively. They’re followed by Cheney, who had $12,000, then Anderson Wilkins (who pointedly says she won’t take contributions from lobbyists), Howland and Zordani, each with under $50,000. Huffman trailed the group, with less than $2,000 in the campaign kitty. All of that pales in comparison to Roskam’s $1.63 million on hand. While the Democratic candidates’ policy particulars may vary, they have a lot in common: support for a path for Dreamers, gun control, keeping (but fixing and improving) the Affordable Care Act. Whoever wins is sure to be heading into the brutal battle ground of a nationally targeted seat in the general election. “I think there’s a fundamental question that the residents of the Sixth District are asking, and that is, ‘Who do we trust to go to Washington D.C. to represent my needs and interests?’ Many campaigns have been focused recently on the need for middle-income tax relief, however when Illinois Democrats passed a massive tax hike on middle-income families across the state, there was a deafening silence,” Roskam said in a statement Tuesday. Feb. 26: U.S. Rep. Dan Lipinski is facing a tough re-election fight in Illinois’ 3rd Congressional District. Lipinski and challenger Marie Newman join us for a candidate forum. Feb. 23: WTTW’s 2018 Voters’ Guide to the Cook County Primary is an online resource designed to inform voters about the candidates running for office in the March 20 election. Learn more.